How many more times is this going to happen? How many more times are we going to allow this to happen? How many more times are we going to pick up a newspaper or turn on a television and see images like we saw today? Or in Denver? Or in Portland last weekend? Or Columbine? Or Tuscon? Or any of the other examples of our too violent society with much too easy access to guns? 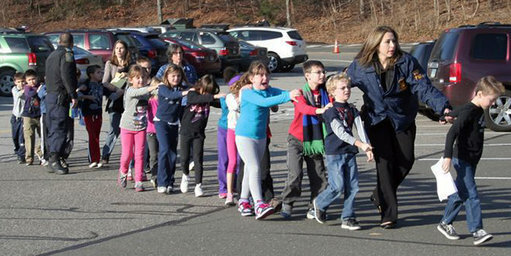 We lost 20 kids and 7 adults today in Connecticut. Their lives ended before they even began. It’s absolutely heartbreaking. A man wearing body armor and armed to the teeth with an assault rifle and semi-automatic pistols walked into an elementary school and shot 26 people (he killed his mother as well as himself). Not only did he kill all those people, he traumatized so many more, like in the picture on the right. It is a terrible tragedy on so many levels. So I’ll come back to my original question. How many more times is this going to happen? How many more times is this going to happen before either we enact some sensible gun control in this country? Or take Chris Rock’s idea of making each bullet cost $5,000. Either one is fine with me. President Obama tentatively stuck his toe in the water today as he reacted to this tragedy. He is being much too timid. We need immediate, comprehensive action to control guns. Our leaders in Washington and in the state houses have an obligation to protect the people from this kind of harm. Kids shouldn’t go to school and not come home because some idiot walks onto the campus and starts shooting. What the hell is wrong with this country, that this can keep happening? That’s a rhetorical question. Everyone is afraid of the NRA. Well, it’s time to get over that. We have the power to do something about this. It is way, way past time to stand up to the gun lobby in America. The Second Amendment was not meant to give people the means to kill other people like this. We’re not living in the frontier time, when guns were genuinely needed for protection. This is a modern, supposedly civilized society. There is no way ordinary citizens should be able to access an arsenal like so many have lately. I’ve only scratched the surface of gun control here. I haven’t talked about the mental health component, and the fact that Reagan gutted the mental health system in this country when he was president. Or how offended I am that Mike Huckabee blames the removal of the lord from the schools for the massacres. Please spare us. America needs to grow up and join the civilized world. It’s time to disarm our citizens. I read an article today on Wonkblog and again I’m astounded by how much government aid the red states consume, yet still keep voting with the conservatives who want no to extremely small government. This doesn’t quite compute for me. The story that got me thinking today is one talking about the fantastic deal the Medicaid expansion portion of the Affordable Care Act (Obamacare) is that so many red state governors want to, in effect, shaft their own citizens by turning down the sweet deal the federal government is offering. This, because anything Obama does is bad. Over the coming weeks and months, there’s going to be a new event in the Republican Party’s ongoing “No, I’m the most anti-Obamacare!” contest: refusing to participate in the law’s proposed Medicaid expansion. So far, the governors of Florida, South Carolina and Louisiana have already promised to do exactly that. Ignore them. The deal the federal government is offering states on Medicaid is too good to refuse. And that’s particularly true for the red states. If Mitt Romney loses the election and Republicans lose their chance to repeal the Affordable Care Act, they’re going to end up participating in the law. They can’t afford not to. I realize that Ezra Klein says to ignore the promises to refuse federal Medicaid money, but it’s hard to ignore those promises without wondering why those governors feel secure enough politically to say those kinds of things without fearing the loss of a lot of votes. Why do the red states keep voting against their clear economic interest? And why are they so happy to keep taking the blue states’ tax dollars that are paid into the government they say they hate? The blue states are happy (ish) to pay those tax dollars, though, and are happy to help those less fortunate than themselves. Why are the blue states reviled? Some of it, no doubt, is the Fox News Effect. People who are rightly angry at the status quo are told what to be angry about. Over and over and over. And they end up believing it. By the end of my stint as a hired Fox News–watcher, my takeaway was, first, that the Democrats invented corruption. Second, regardless of different formats or different anchors, whatever else was going on in the world of news, each show featured the same big story. When I watched, it was the growing controversy about Solyndra. How does Fox get its big story of the day? Several ways. I remember one coup regarding the Department of Agriculture official who gave a speech that made her seem racist. A video excerpt had fallen into Fox’s hands over the transom, as they say, and by the end of the day of repetition on Fox and elsewhere the official had been fired. That was enterprising investigative journalism at its finest. When the whole speech was played, however, it turned out that the fired official actually had been making a strong civil rights statement. Somebody had performed a contextectomy. It was a clear violation of the Geneva Convention on TV Journalism, which calls for telling the whole truth, not just half or a quarter. How could that story have gotten legs? It wasn’t true. Yes, but the more you repeat something on TV, the truer it becomes. Third, I learned how people are Foxified: it comes from watching too much Fox News over a period of time. They fall asleep watching reruns of O’Reilly and Hannity, starting at 11 or midnight. Instead of turning into a cockroach like the guy in the Kafka story, they wake up as a right-wing ideologue, or as we progressives call them, nuts. The BBC says that people in red states resent having solutions force-fed to them. This sounds plausible to me. As the saying goes, in politics, when you are explaining, you are losing. It’s clear that health care reform is the right thing for the country. It’s also true that trying to help the poor is the proper thing to do. I — and other liberals — think that this is a role for government. I think we all agree that people should pull themselves up by their own bootstraps, but so many people don’t have bootstraps to pull themselves up by. The red states keep getting redder — that’s where the bulk of the tea party is coming from. Fox News keeps on going on with its version of the facts and people keep buying it. I don’t know how the Democrats get around that. It’s obviously a messaging problem, one that the Democrats are going to have to solve. I would suggest that Democrats make the Republicans feel like it’s their idea, but with healthcare reform, the Democrats used a Republican idea! So how is this solved?